Hey folks!! It’s come to my attention that something wonky happened with a few of the links leading to this post last week! Because I have no idea how to fix them, here’s a re-post for those of you who missed it. Hope everyone is having a great Monday! A few nights ago, I was lying in bed and couldn’t sleep. As is usually the case when this happens, my mind was wandering, mulling over the day and obsessing over the types of big life questions that only haunt you after midnight. In the midst of if all, a realization came to me. It’s the kind of realization that seems so simple, and so obvious, I can’t believe I didn’t think of it before – and yet, sometimes it’s those basic common sense things that are the hardest for us to wrap our minds around. It’s almost as if our brain takes them for granted as obvious before we even have a chance to become fully and consciously aware of them. 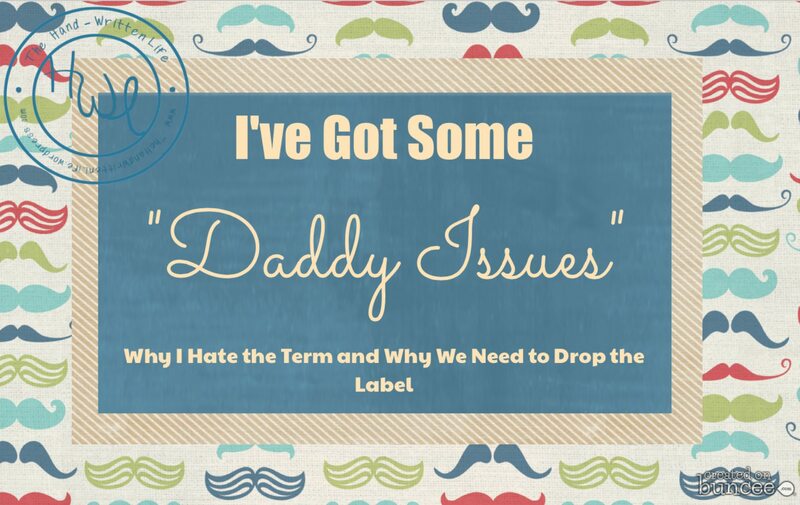 What I realized that night is that I hate the phrase, “daddy issues.” Which is weird, because honestly, for the most part, I’ve never really thought of it before. In fact, I’ve been guilty of using the phrase to describe people (mainly girls) in a derogatory manner since I first learned it. But upon further inspection, I’ve come to understand how harmful such a little term really is. What people who use this term are saying is, “this girl has issues because she grew up without a father figure,” but what they mean is that she’s whiny or needy or afraid of commitment or slutty or has trust issues, or is somehow “defective” in some way. If she’s got “daddy issues” there’s something wrong with her: she’s weak, she’s insecure, she should just get over it – but rather than reach out to help her, you should probably just stay away from her because that girl’s got problems, and she’s probably a bad influence, too. If you’ve ever watched television, you should have an idea of what I’m talking about; this girl has been stereotyped and played out over and over again in dramas, sitcoms, and reality shows alike. However, this attitude that we all collectively share, regardless of how unconscious it may be (I certainly didn’t think this was an attitude I held! ), still adds to the stigma surrounding mental health by trivializing large issues, and labeling people instead of understanding them. It also adds to the undercurrent of sexism that runs through our culture by being a “socially acceptable” form of it – in that the term is basically never applied to males and is reserved solely to describe a female who grew up without a father. If a young boy from a poor neighborhood joins a gang and makes a bad decision because he’s looking for a family, nobody calls him out on his “daddy issues.” Because culturally, we understand that having an absentee parent actually does have a negative effect on children’s lives. As a society we can basically all agree that to write the behavior of troubled young men off with a shrug and the label of “daddy” (or mommy) issues is not only far from an effective solution to the problem, but anyone who made the misstep of doing so, publicly, would be immediately devoured by mental health experts and the media alike. Additionally, since we know having an absentee parent does have a negative effect on children (and the adults they later become), it is not only flippant but also, in my mind, irresponsible to slap on a label of “daddy” or “mommy” issues, because it completely trivializes and disrespects a really big trauma in the lives of those in question. One would NEVER tell a girl who’s father had died that she had “daddy issues” – how appalling would it be to blame her for her feelings surrounding the death of her father?? But if your father walked out on you, was a deadbeat, was abusive, etc – and you grow up with some insecurities surrounding this, people have no problem letting you know that you’ve got some real issues because of it. However unconscious that may be, it’s still an example of victim blaming in it’s finest. In reality, both young women are mourning the loss of their father and should receive the exact same compassion, understanding, and guidance from their community. Think of it this way, if every time you thought to yourself, “man, that girl has daddy issues,” she could hear you – and she turned around to face you and responded, “yes, actually, I do – my dad walked out on the family when I was 6 years old and I never saw or heard from him again,” your judgement would probably dissolve in an instant and you would be left feeling horribly guilty and sad at the realization that the girl in front of you has known great pain in her life – just like you probably have. Instead of a moment of judgement, it should have been a moment of empathy and compassion. So why do we do it? Like I said, I know I’m guilty of it. What it comes down to is this: the embarrassment or shame that we may feel as a culture, over our failure to support and educate families – leading to the breakdown of some – should not be the burden of the children to bear. People are only willing to reach out for help when they know there is someone who actually cares on the other end. By stigmatizing these issues, we are actually preventing the people who face them from asking for a helping hand when they most need it. I say it’s time for us to take a good hard look at ourselves and this phrase and see what we can do to make a change. It might be a small change in our own lives, but culturally, I guarantee the shift will have huge results. What do you think? 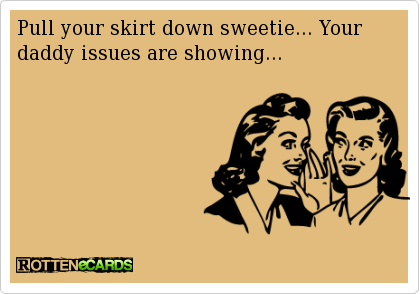 Do you think the term “Daddy Issues” contributes to sexism in America today? Or do you think it’s a harmless phrase? Are you willing to join me in dropping the label and spreading awareness? If so, please Like or Share this post! I think that is so much easier to blame than to understand! And people often don’t want to think about why something might be a certain way because it might make them uncomfortable or have to question the way the see things and unfortunately most of us don’t like discomfort and change. We have our busy lives or whatever and we just go on our way with our view of the world and don’t take the time to stop and reflect because if might require some action on our part. Its easier to just lump things in a certain category and go on our way. BUT life is full of complexity and gray areas and we need to be more accepting of this and not just jump to the easiest or the most “accepted” conclusion or explanation. This post has made me think about so many things and sparked some great conversations. Thank you!!!!! Charles, you raise a good point. We will continue to label and insult though our terminology may change. However, I think that it is good for us to stop and examine what we say sometimes and think about what it really means or conveys and for those of us who may be unwittingly contributing to something we don’t want to, we can stop. Raising awareness about difficult issues people face is a good thing! Words are powerful and while we can go overboard with worrying about what we say and how it might be offensive to someone (there is almost always going to be someone we offend in some way or another), we do need sometimes to examine those “automatic” phrases, stereotypes etc, that we use and see if they are really what we want to be communicating.